Floaters and flashers - not just the least desirable things to find in a public restroom, but also signs that you could be going blind from inhaling too much welding/fiberglassing fumes. The truth is that when you are doing a garage project you don't pay attention to OSHA limits on fume inhalation. What starts out as an attempt to turn a VW Bug into a Manx style buggy can go horribly wrong...or horribly awesome. Find this 1973 Volkswagen Beetle Boatswagen currently bidding for $3,049 reserve-not-met with 2 days to go. At first glance this looks like a boat on a low-slung trailer, but this is actually a fully functional (that is a relative term) automobile... unfortunately it does not float. With the original 60 horsepower flat-4 out back it should be good for freeway speeds, but aero(hydro? )dynamics may become an issue at higher speeds. I had planned to build a low budget VW Manx styled dune buggy, but was unable to find a decent used buggy body. 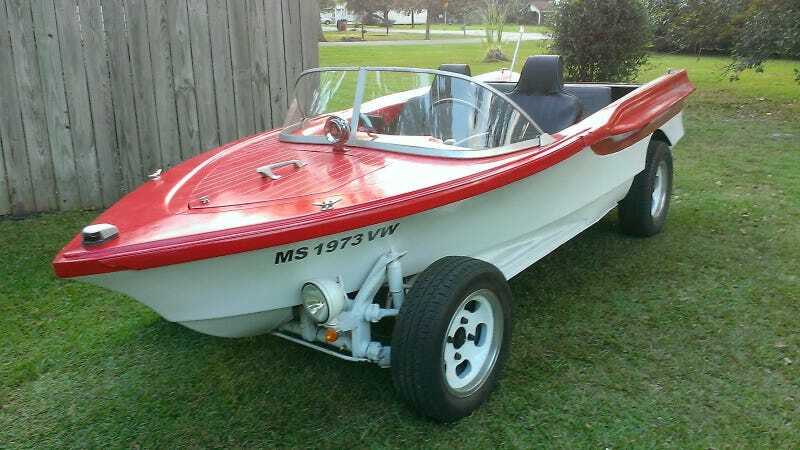 Then I stumbled onto a fiberglass 1956 Hydrodyne sport runabout The boat had been buried in waist deep weeds for a few decades and was about the same condition as the Volkswagen. What better way to bring them back to life than having them both serve as donor vehicles for each other. With that, was born the "Boatswagen". This isn't a good car for someone concerned about silly things like safety, fuel economy, staying dry, but for the price you won't get more smiles per mile. Originally posted as 5k: Floaters And Flashers: 1973 Volkswagen Beetle Boatswagen on Daily Turismo.